George Best (May 22, 1946–25 November 2005) was a football (soccer) player from Belfast, Northern Ireland, regarded by many as the one of the greatest footballers of all time, whose brilliant career was cut short due to excessive use of alcohol. He is mainly remembered for his days with Manchester United under famed coach Matt Busby. He also played for the national team of Northern Ireland. Best had a rare combination of pace, blistering acceleration, balance, two-footedness, goalscoring prowess, and the ineffable ability to run through entire defenses. His dribbling skills were legendary and his good looks attracted many female fans to attend games. Best's habit of playing with his shirt not tucked into his shorts was emulated by many youngsters at the time. He was also one of the first players to be widely commercially marketed. Best played for Manchester United as a winger (playing on the extreme wing position) on the left flank between 1963 and 1974, helping Manchester win the Football League First Division in 1965 and 1967, and the European Cup in 1968. He was named European Footballer of the Year and Football Writers' Association Player of the Year in 1968. In speaking to Man Utd TV after Best's death in late 2005, Sir Bobby Charlton described Best's impact on the 1960s as "sensational." Best's lovable, impish image won him many fans, both during his career and after. However, his drunkenness and allegations of domestic violence resulted in some disappointment and even animosity toward him. Nonetheless, news of Best's death led to tears on the streets of Belfast, before and during a funeral for which some 100,000 people turned out on a rainy day. Hugh McIlvaney, a British sports writer for the The Sunday Times (London), perhaps described Best most succinctly: "On the field, he was the incarnation of the game's most romantic possibilities. He appeared to regard gravity as an impertinent con trick unworthy of being taken seriously, gracefully riding tackles that looked capable of derailing a locomotive." 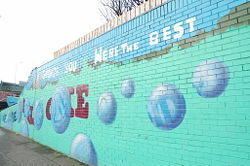 Graffiti in the New Lodge area of Belfast in honor of George Best. At the age of 15, Best was discovered in Belfast by Manchester United scout Bob Bishop, whose telegram to United manager Matt Busby read: "I have found a genius." His local club, Glentoran, had previously rejected him for being "too small and light." Best was subsequently given a trial and signed up by chief scout Joe Armstrong. But the shy and home-sick youngster fled back to Ulster within 24 hours. He was finally persuaded to return and settled in at the club where he was befriended by United star Dennis Law. Best turned professional and made his debut for Manchester United against West Bromwich Albion at Old Trafford. In his first game, he played on the left wing and faced Albion defender and Welsh national team player, Graham Williams, who he "numegged" (played the ball through the open legs of his opponent and collected it on the other side) and totally out-played Williams. He became world famous at the age of 20 when he scored two goals in a European Cup match against Benfica in 1966 and headlines in the Portuguese press proclaimed him "El Beatle," because of his longish hair and long sideburns. He scored in United's European Cup final win against the same club in 1968. Best made 466 appearances for Manchester United in all competitions, scoring 178 goals. He was United's top scorer for six consecutive seasons. During this run he also topped the first division scoring charts in 1967-68 with 28 goals, remarkable for a player who was not an out-and-out striker. By the early 1970s, Best's excessive use of alcohol was taking its toll. He missed training sessions and was fodder for the British tabloids. In 1974, the 27-year-old Best was sacked by United for excessive drinking and persistent failure to attend training sessions and matches. His last competitive game for the club was on January 1, 1974 against Queens Park Rangers at Loftus Road. With Best gone, United were relegated to the Second Division for a season (1974-1975) and did not win another top-flight title until the 1992-93 season. His "second team" after Manchester United is usually considered to be Fulham Football Club. Best had made a return to England after 'retiring' to the USA, where he played nine games with the San Jose Earthquakes, and still had his amazing skills, even though he had lost his pace slightly. Best scored some amazing goals for The Cottagers and is particularly remembered for tackling his "old drinking mate" Rodney Marsh in a FA Cup game against Hereford United (despite both being on the same team!). Best stated later that he enjoyed his time most while at Fulham, despite not winning any honors. He and Marsh later became an after-dinner act, telling jokes and stories about their playing days. The Best Five Pound Note. Over the next decade, Best drifted between several football clubs including spells in America, Scotland, and Australia. He played for three clubs in America: Los Angeles Aztecs, Fort Lauderdale Strikers and San Jose Earthquakes; he also played for the Detroit Express on a European tour. Best reveled in the anonymity America afforded him and was a success on the field, too, scoring 15 goals in 24 games in his first season with the Aztecs. In his second season, he was named as the NASL's best midfielder. Best began a slow decline in his third U.S. season, scoring only once in 12 appearances. His moves to Fort Lauderdale and San Jose were also unhappy, as his off-field demons began to take control of his life again. At San Jose, the club was owned by Milan Mandaric, with whom George developed a close relationship over the years. In 1983 George finally retired from the game, at the age of 37. His last games as a professional were with third division A.F.C. Bournemouth. When fit, Best was an automatic choice for the national team of Northern Ireland, but was never able to display his special talent on the world stage because of his national team's lack of success during the peak of his career. He consequently never played at the World Cup. He was capped 37 times for Northern Ireland, scoring nine goals. He played mainly as a winger and was known for his dribbling skills and passing. On May 15, 1971, Best scored the cheekiest and arguably the most famous "goal" of his career at Windsor Park in Belfast against Gordon Banks. The English goalkeeper was about to kick the ball downfield and dropped the ball towards his left foot. However, Best had anticipated the move and, with his right boot, knocked the ball up in the air behind Banks. The famous duo both scrambled towards the net, but Best outpaced Banks and headed the ball into the empty goal, to the delight of the home supporters. His effort was disallowed for "ungentlemanly" conduct by a referee whose back had been turned away from the incident, but even this untimely and incorrect intervention did not spare Banks the embarrassment of having been outwitted. In his native Northern Ireland Best is usually considered the finest player to ever take the field, summed up by the local saying: "Pelé good; Maradona better; George Best." Best was considered briefly by manager Billy Bingham for Northern Ireland's 1982 World Cup. However, at 36 and with his footballing days largely behind him, it was understandable that he was not selected in the Northern Ireland squad, thereby denying him the one chance of playing in front of a global audience. Northern Ireland did surprisingly well at the 1982 finals, topping its opening round group and beating hosts Spain 1-0, before slipping up in the second round with a 4-1 loss to France. In view of his home country's relative lack of success overall at World Cups, Best was an advocate of an all-Ireland team. Best once scored six goals in a Cup game against Northampton Town in 1970. He is reported to have said after the game: "I felt so embarrassed I played the last 20 minutes at left-back." Diego Maradona has frequently named Best as his all-time favorite player  and Pelé named him as one of the 125 best living footballers in his 2004 FIFA 100 list. In 1988, a testimonial match was held for Best at Windsor Park, Belfast. Amongst the crowd were Sir Matt Busby and Bob Bishop, the scout who discovered Best, while those playing included Argentine star Ossie Ardiles, Pat Jennings, and Liam Brady. Best scored twice, one goal from outside the box, the other from the penalty spot. In 1998, Best became a football pundit on Sky Sports. In November 2004 he agreed to join English Premier League club Portsmouth Football Club as a youth coach, citing his desire to get involved in football again. The eldest child of Dickie and Anne, Best was brother to Carol, Barbara, Julie, Grace, and Ian. His father worked in the dockyards and his mother was an alcoholic. Best was married twice. His first marriage was (1978-1986) to Angela MacDonald-James, with whom he had a son, Calum Best. His second marriage (1995-2004) was to Alex Pursey. In 1984, Best received a three-month prison sentence for drunk driving, assaulting a police officer and failing to answer bail. He spent Christmas of 1984 behind bars and turned out as a player for Ford Open Prison. On February 2, 2004, Best was convicted of another drunk driving offense and banned from driving for 20 months. Best developed a drinking problem while still a player, and it contributed to his early retirement from top-level football. It was the "Swinging Sixties" and he loved the night-life and visiting the night-clubs around Manchester, and also in London. He was unable to give up alcohol for any length of time. In September 1990, Best appeared on an edition of primetime BBC chat show Wogan in which he swore and was clearly drunk. He later apologized and said this was one of the worst episodes of his alcoholism. The condition of his liver deteriorated to the point where a transplant became necessary. In 2002, he had a liver organ transplant. A year later he was the focus of much criticism when, despite his transplant, he openly drank white wine and was accused of being selfish and having no regard for other people's feelings. Also in 2004, his second wife, Alex, appeared as a contestant on the reality television program I'm a Celebrity, Get Me Out of Here! and alleged that Best physically abused her during their relationship. Meanwhile, the immuno-suppressive drugs given to prevent rejection of his new liver caused him to develop a serious kidney infection, which his doctors were unable to redress. In 2005, the infection caused him to fall into a coma. His final days were watched over by his father and other family members, and also by former football colleagues such as United's Denis Law. He died at the age of 59 and is buried in East Belfast. Gates of Belfast City Hall soon after Best's death. Best continued to drink, and was sometimes seen at his local pub in Petersfield, Hampshire. On October 3, 2005 Best was admitted to intensive care at the private Cromwell Hospital in London, suffering from kidney problems caused by the side-effects of immuno-suppressive drugs used to prevent his body from rejecting his transplanted liver. On November 20, the British tabloid News of the World published a picture of Best at his own request, showing him in his hospital bed, along with what was reported to be his final message: "Don't die like me." Of the many tributes left to George near his hospital bed, one was a signed football which read: "From the second best player in the world." It was signed by Pelé, the man many people consider to be the greatest player ever to play the game. In the early hours of November 25, 2005, Best's treatment was stopped; he eventually died, after a battle that lasted longer than doctors had expected from a lung infection and multiple organ failure. His father, four sisters, brother, son Calum and his agent and friend, Phil Hughes, were all at his bedside, as was his former United team-mate Denis Law. The FA Premier League announced that a minute's silence would be observed before all Premiership games to be held over the weekend of his death, however, this tradition was ignored at many grounds, in favor of a minute's applause in his honor. The first match at Old Trafford after Best's death was a League Cup tie against West Bromwich Albion, the club against which he made his debut for Manchester United in 1963. The match was preceded by tributes from former team-mate Sir Bobby Charlton, and Best's son Callum and former team-mates, surviving members from the West Bromwich Albion team which he played against in his debut. 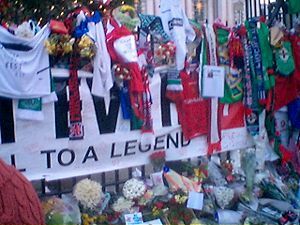 Many football supporters traveled to pay tribute to Best outside Manchester United's stadium Old Trafford, Windsor Park in Belfast and at Belfast City Hall and outside his father's home where they left signed shirts, scarves, flowers and messages. His body left the family home at Cregagh Road, East Belfast, shortly after 10 a.m. on Saturday, December 3, 2005. The cortège then traveled the short distance to Parliament Building of Northern Ireland, the Stormont. The route was lined with around 100,000 mourners. There was an 11 a.m. service in the Grand Hall relayed to around 25,000 mourners inside the grounds of Stormont, and live on BBC One, Ulster Television, Radio Telefís Éireann, ITV News, BBC News 24, Sky News, Sky Sports News, EuroNews and MUTV. Afterward, Best was buried beside his mother Annie Elizabeth Kelly in a private ceremony at the hill-top Roselawn Cemetery, overlooking east Belfast. While at Manchester United, Best's talent and showmanship made him a crowd-pleaser and media favorite but his celebrity lifestyle led to problems with gambling, womanizing, and alcoholism. Best often told the story of a bellboy who entered his hotel room with breakfast in the late 1970s. Seeing Best in bed with Mary Stavin, the current Miss World, a bottle of champagne and several thousand pounds of cash won from a night's gambling, the youth exclaimed, "George, where did it all go wrong?" Best opened two nightclubs in Manchester, in the late 1960s, Oscar's and the other called Slack Alice's (which later became 42nd Street Nightclub). He also owned fashion boutiques, in partnership with Mike Summerbee, a star striker from crosstown club Manchester City Football Club. He also opened "Bestie's Beach Club" (now called "The Underground" after the London subway system) in Hermosa Beach, California U.S.A. and lived in the city throughout the 1970s, 1980s, and 1990s. He was able to achieve some "treasured anonymity" there. George was the subject of many books and wrote his life story a number of times. The Good, The Bad and The Bubbly, co-written with Ross Benson, was the first to touch on his alcoholism. However, he was even more self-revealing in Blessed and Scoring At Half Time, written with Roy Collins and Martin Knight, respectively, shortly before his death. Football League Championship winners medal, 1965 & 1967. UEFA European Cup winners medal, 1968. European Footballer of the Year, 1968. Football Writers' Association Footballer of the Year, 1968. Holds the record for the most goals by a Manchester United player in a single match, six against Northampton Town F.C., FA Cup fifth round on. February 8 1970. United won the match 8-2. Freeman of Castlereagh Borough Council, 2002. Inaugural Inductee into the English Football Hall of Fame, 2002. Honorary Doctorate from the Queen's University of Belfast, 2001. Professional Footballers Association Special Merit Award, for his services to football, 2006. 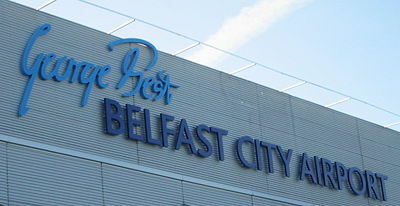 Belfast City Airport has been renamed  George Best Belfast City Airport as a tribute to the East Belfast footballing legend. The official new name and signage was unveiled to a gathering of the Best family and friends at the airport on 22 May 2006 which would have been his 60th birthday. After Best's funeral, his family contacted the airport, indicating that they felt that this would be the most appropriate memorial. Not everyone in Northern Ireland considered the renaming of the airport to be appropriate. While his prowess as a footballer is almost universally acknowledged, many people - in Northern Ireland and beyond - believe that his drunken antics, caused by his alcoholism, and his treatment of women meant that such posthumous recognition was undeserved. Also, the fact that an airport was renamed after Best was felt by some to be too great an honor, as he had only contributed to the world of football and not society as a whole. In March 2006, Flybe, the airport's biggest operator, named a Dash-8 plane G-JECL The George Best. The specially branded Q400 aircraft was used to carry Best's family across to the Manchester memorial service for Best. 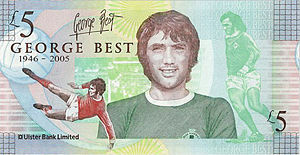 On the 60th birthday anniversary, 22 May 2006, a special gala dinner was held in George's honor at Belfast City Hall, and an auction was held to raise funds for the George Best Foundation. One of the items featured was the 'Genius' egg from the world famous jewelers Fabergé . All profits from the sale of the eggs will be donated to the George Best Foundation. For the first anniversary of his death, Ulster Bank issued one million commemorative five pound notes. The notes were sold out in three days. Official website. The George Best Foundation. Football legend George Best dies news.bbc.co.uk. United in grief for a tragic hero - The Guardian. May, John, 11.25.05. Was Georgie the Best? - BBC Sport. George Best Timeline. Guardian Unlimited. This page was last modified on 13 June 2017, at 21:38.